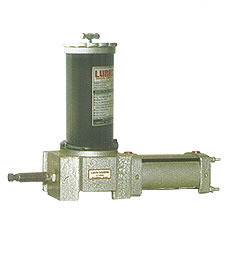 The Pneumatic Cylinder is buit-in with the Pump and is operated with Pneumatic lines connected to the ports of the cylinder through manual / electrical Direction Control Valve. During the forward stroke, greaseis ejected under pneumatic pressure from the outlet port of the pump body and during the reverse stroke of the cylinder grease is sucked through suction port in to the pump body. These pumps are wall mounted and should be installed in vertical position at a place conveniently accessible to the operator. 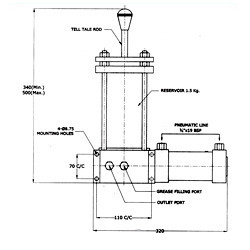 Bleed Valve is provided on the pump body to bleed air entrapped in the system. Before operating the pump, Bleed Valve is kept open till the continue flow of grease starts from it. A tell tale rod projecting through the container top indicates the remaining grease at any time. To ensure that Pneumatic lines to the pump is dust & moisture free - Provide Filter & Regulator unit in the air lines. Maximum Pressure 50 kg/ sq.cm.